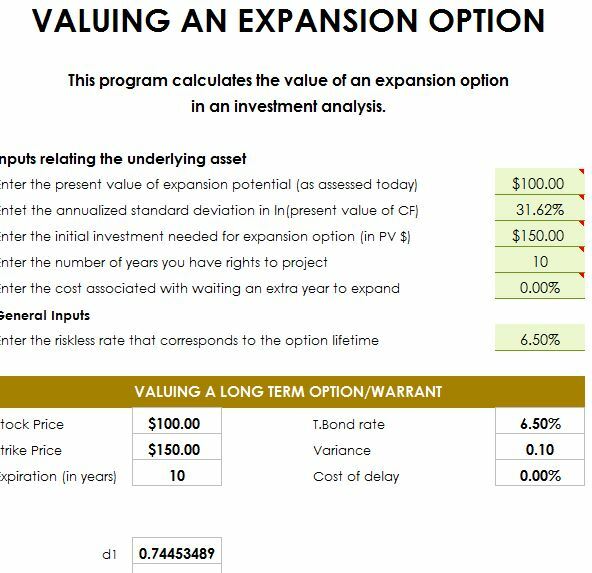 If you’re looking to expand your empire to bigger and better things, the free Valuing an Expansion Option template allows you to estimate the value of your expansion to see if it will be a worthwhile endeavor, based on your current financial information. The free template will give you a list of items that you simply need to fill in with your own data. Then, the template will calculate important information, like the stock and strike price of your investment, and much more. To give this free document a spin, you can follow the instructions given below. After you have downloaded the free template document by following the link at the bottom of this page, you are free to start editing the information that’s been already listed. You will start by entering details in the highlighted columns below. You will see an example business that is already thinking about expanding, just like you. They entered their information, just as you will. To replace the examples, just click inside the cell and enter something new. That’s all there is to it. Since this model estimates the value of the option to expand in an investment project, you will modify it to assess the value of your different strategic options. The data that you enter in the top section of the template will be calculated and run through formulas to give you the information that you see in the bottom section. Notice, that you will receive the stock and strike prices of your investment, as well as the variance and cost of delay for an expansion project. Using the information you will acquire through this template, you will gain the confidence to make the best decision possible for your company as a whole.